Custom teaparty teapot cake birthday Cakes Long Island New York. This teapot cake was created for a special tea party themed wedding shower celebration. 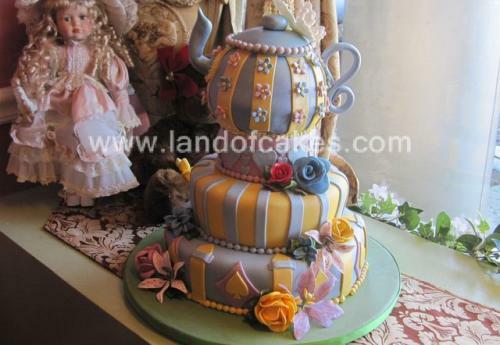 We customize teapot cakes for any occasion including birthdays, sweet 16s, anniversaries etc. This particular teapot cake consists of multiple tiers with chocolate and vanilla cake. Each tier is filled raspberry mousse except for the teapot which is filled with a chocolate Kahlua filling. Each tier was decorated with edible fondant frosting and handmade lifelike edible flowers. There is also an elegant sugar butterfly on top of this custom designed teapot cake. For a beautiful cake, and a personal touch order your next cake from land of cakes New York.